I'm happy to say I've ticked another item off my "to do" list today. I just completed this 8" x 10" acrylic study of a male wood duck. I am entering another duck stamp contest for the state of Washington and felt I needed to get a few more waterfowl paintings under my belt before I did that. Wood Duck Reflections - Acrylic 8 x 10"
I chose to paint a wood duck for several reasons. First, they are incredibly beautiful birds with every color of the rainbow in their feathers. Under the right light they glow with iridescence. I thought it would be a great challenge to try and capture that iridescence with paint. 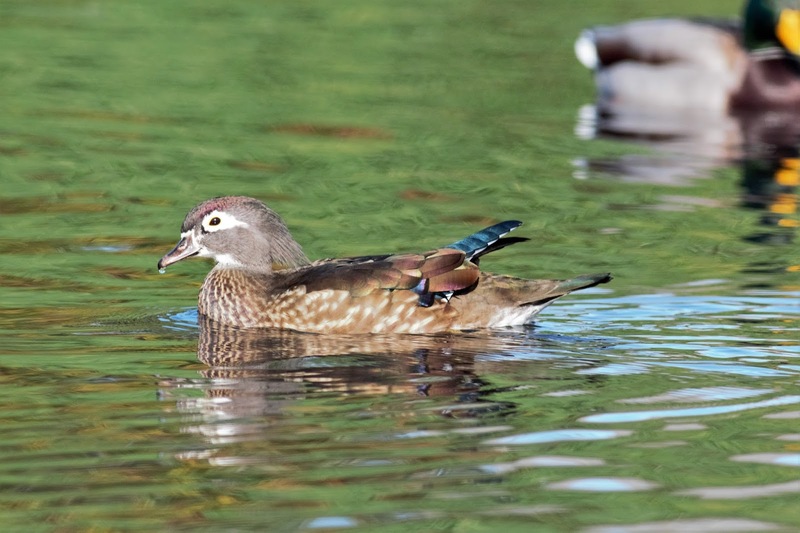 Second, while duck hunting recently my husband harvested a male wood duck, so along with my reference photos I had a bird in hand to study up close. It's always so much easier to understand the colors, textures and details of the feathers when you can see them in 3-D as opposed to a flat photo. The third reason came to me as I sat down to write this. A memory from my past floated to the surface that I haven't thought about in years. My father raised exotic birds in our backyard when I was a child and had purchased a pair of wood ducks for my sister and I to raise. Mine was the male. Sometimes we took these birds to game bird shows where they would be judged for prizes much like the animals are judged at fairs. 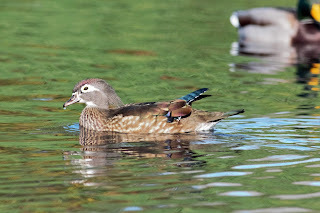 Our pair of wood ducks got first prize one year. I even got a trophy! With the holidays just around the corner it might make a nice present for a waterfowl hunter or bird watcher. Life continues to be a little crazy around here lately and I find myself working on multiple projects at once. Not only have I been signing the duck stamp prints, but I have also been working on one of two large commissions for Christmas and trying to get a few smaller pieces done for another duck stamp contest and something for my Christmas card. The month of November is going by way too quickly and I'm feeling just a tad overwhelmed that I won't be able to complete everything on my list before the deadlines and still try to squeeze in a life in between. I have also sent three of my paintings to the Valley Art Center in Clarkston, WA. for their annual Snake River Showcase show. It will run through the month of November. My piece "Dawn Patrol" took a blue ribbon in the watermedia catagory. While at the opening reception I was approached about teaching a workshop some time next year. I'm touched that they would consider my abilities worthy of being taught to others, but, holy cow, I'm not sure I'm ready for that! I'm really not a large group person and don't enjoy being front and center so I will have to think long and hard about this. I have some time before I have to give them an answer. In the meantime, I have more pressing things to do like paint, paint, PAINT!! Here we are in November already! I can't believe how fast the months are going. I had every intention of posting that I had found some inspiration last month, but about the time I found it things got a little crazy around here. I ended my post that God always provides and He did. Just a few days later I received two painting commissions for Christmas presents. Unfortunately, I can't post anything about them as they are going to one of my blog and Facebook fans and I don't want to spoil the surprise, so you'll have to wait until January to see those. The other news is that the Delaware duck stamp prints have begun to arrive. I have 700 so far that need to be signed, numbered and returned a.s.a.p. Me and a few of 700 prints! Four boxes of them showed up the other day and it really started to sink in what this duck stamp win means. I feel a bit like I've stepped into someone else' life. I have become a part of duck stamp history and while I'm excited about that I'm humbled as well. This couldn't really be me, could it? Well, apparently it is because no one else will be signing all those prints! Most of these prints will be returned to Delaware and will be available for sale some time between April and July 2017. The stamp itself will not be available until July 2017. I will be keeping 150 Artists Proofs and some of those will be for sale some time soon. I will post the information here with links to Delaware's site as those details become available. Until then it's back to painting and signing!